Process of how a reconditioned stairlift Installation Is Carried Out. Installing a Reconditioned Stairlift can be intriguing, exciting and also challenging. It’s important to understand how the process is carried out when installing a Reconditioned Stairlift If not, the results are just not going to come out as intended. We have outlined the procedure when you are thinking about purchasing a Reconditioned Stairlift. The first step we take is to assess the physical condition of a stairlift before we carry out our 50 point check. Having a solution that’s safe is of utmost importance and is our top priority. 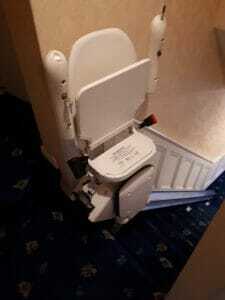 It is for this reason that we only recondition stairlifts that are 2-3 years old. We specialize in reconditioned stairlifts so we have a strict criteria when reconditioning a stairlift. Once we issue a price over the phone for either a curved or straight stairlift, we then carry out a site survey to get the exact measurements of where is the stairlift is going to be installed?,How is the staircase setup and its current state? it is worth nothing that stairlifts are bolted to the staircase not the wall. We will need to find the ideal power source as close to the staircase as possible. This will also play a role in how long the installation will take, but the common misconception is that the power source must be at the bottom of the stairs, this isn’t the case, it can be under the stairs or at the top of the stairs. We can create a clear path to the stairlift. We will also make sure that there’s no lose cables and nothing will be left untidy. A reconditioned stairlift will need to be tested by the costumer to ensure its fully functional, usable, and safe. For this reason, we will carry out a full demonstration with the person who’s going to be using it. At the end of the install we will issue a docket, this docket is your warranty. To give our clients peace of mind we issue 2 years warranty with all our stairlifts.